The celebrated Dr. Johnson made a lasting contribution to English literature as a poet, essayist, moralist, literary critic, biographer and lexicographer. 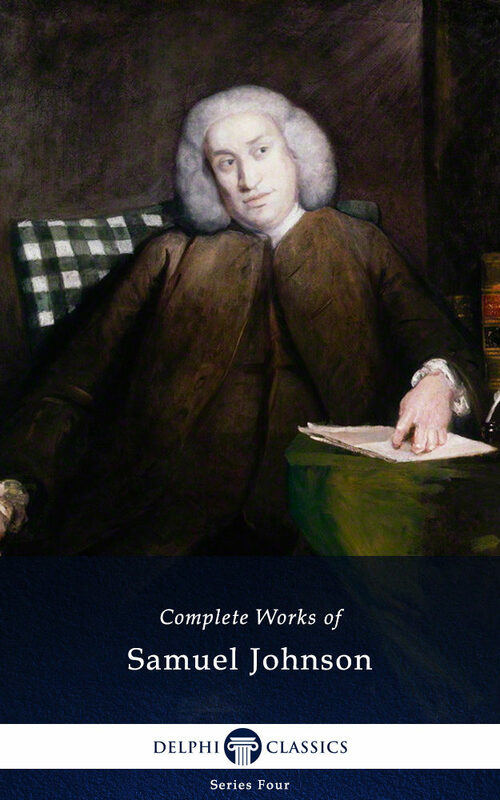 This comprehensive eBook presents the complete works of Samuel Johnson, with numerous illustrations, informative introductions and the usual Delphi bonus material. (Version 1)* Beautifully illustrated with images relating to Johnson's life and works* Concise introductions to the major works* ALL the essays, articles, pamphlets, biographies and critical works* Rare works often missed out of collections* Includes the posthumous collection PRAYERS AND MEDITATIONS, appearing here for the first time in digital print* Includes a generous selection of entries for the original 1755 Dictionary, with many definitions for all letters of the alphabet, as well as the original plan and preface* Images of how the books were first printed, giving your eReader a taste of the original texts* Excellent formatting of the texts* Special chronological and alphabetical contents tables for the poetry* Easily locate the poems you want to read* Special criticism section, with essays evaluating Johnson’s contribution to literature* Features four biographies – immerse yourself in Johnson's world! * Includes the complete edition of Boswell’s seminal biography, as well as a useful abridged version* Scholarly ordering of texts into chronological order and literary genresPlease visit www.delphiclassics.com to browse through our range of exciting titlesCONTENTS:The Essays and PamphletsA VOYAGE TO ABYSSINIAMARMOR NORFOLCIENSEA COMPLEAT VINDICATION OF THE LICENSERS OF THE STAGETHE PLAN OF A DICTIONARY OF THE ENGLISH LANGUAGETHE RAMBLERTHE ADVENTURERTHE IDLERTHE FALSE ALARMTHOUGHTS ON THE LATE TRANSACTIONS RESPECTING FALKLAND’S ISLANDSTHE PATRIOTTAXATION NO TYRANNYA JOURNEY TO THE WESTERN ISLANDS OF SCOTLANDDEBATES IN PARLIAMENTA CONVERSATION BETWEEN HIS MOST SACRED MAJESTY GEORGE III AND SAMUEL JOHNSON LIDMISCELLANEOUS PAMPHLETS, REVIEWS AND ESSAYSPRAYERS AND MEDITATIONSThe NovellaTHE PRINCE OF ABISSINIA: A TALEThe DictionaryPREFACE TO A DICTIONARY OF THE ENGLISH LANGUAGESELECTED DICTIONARY ENTRIESThe BiographiesAN ACCOUNT OF THE LIFE OF MR RICHARD SAVAGETHE LIVES OF THE MOST EMINENT ENGLISH POETSTHE LIVES OF EMINENT MENThe Literary CriticismMISCELLANEOUS OBSERVATIONS ON THE TRAGEDY OF MACBETHPROPOSALS FOR PRINTING THE DRAMATICK WORKS OF WILLIAM SHAKESPEAREPREFACE TO THE PLAYS OF WILLIAM SHAKESPEARENOTES TO SHAKESPEARE’S PLAYSGENERAL OBSERVATIONS ON THE PLAYS OF SHAKESPEAREThe PlayIRENEThe PoemsLIST OF POEMS IN CHRONOLOGICAL ORDERLIST OF POEMS IN ALPHABETICAL ORDERThe CriticismDR. JOHNSON AND HIS CIRCLE by John BaileySAMUEL JOHNSON by Richard Claverhouse JebbSAMUEL JOHNSON by Leslie StephenSTUDIES OF A BIOGRAPHER by Leslie StephenA POETICAL REVIEW OF THE LITERARY AND MORAL CHARACTER OF JOHNSON by John CourtenaySAMUEL JOHNSON by Nathaniel HawthorneSAMUEL JOHNSON by C. E. VaughanANECDOTES OF THE LATE SAMUEL JOHNSON, LL.D. by Hester Lynch PiozziTHE REAL DR. JOHNSON by G. K. ChestertonA REMINISCENCE OF DR. SAMUEL JOHNSON by H. P. LovecraftThe BiographiesTHE LIFE OF SAMUEL JOHNSON LL.D. by James BoswellBOSWELL’S LIFE OF JOHNSON (ABRIDGED) by Charles Grosvenor OsgoodMACAULAY’S LIFE OF SAMUEL JOHNSON by Baron Thomas Babington MacaulayAN ESSAY ON THE LIFE AND GENIUS OF SAMUEL JOHNSON by ‎Arthur MurphyPlease visit www.delphiclassics.com to browse through our range of exciting titles.